New measurements of tiny galaxies contradict scientists' best model of dark matter, further complicating the already mysterious picture of the stuff that is thought to make up 98 percent of all matter in the universe. Dark matter, the invisible material thought to permeate the universe, can only be indirectly detected through its gravitational pull on the normal matter that makes up stars and planets. Despite not knowing exactly what dark matter is, scientists have gradually built up a good model to describe its behavior. The model envisions dark matter made up of cold, slow-moving exotic particles that clump together because of gravity. This "cold dark matter" model has done remarkably well describing how dark matter behaves in most situations. However, it breaks down when applied to mini "dwarf galaxies," where dark matter appears more spread out than it should be, according to the theory. In a new study, researchers calculated the mass distribution of two dwarf galaxies using a new method that did not rely on any dark matter theories. The scientists studied the Fornax and Sculptor galaxies, which orbit the Milky Way. According to the model, the centers of galaxies should be packed with dense clumps of the invisible matter. But dark matter appears to be spread evenly throughout Fornax and Sculptor, as well as other dwarf galaxies whose mass distributions have been measured in other ways. 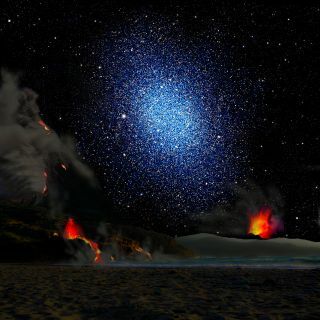 "If a dwarf galaxy were a peach, the standard cosmological model says we should find a dark matter 'pit' at the center," researcher Jorge Peñarrubia of England's University of Cambridge said in a statement. "Instead, the first two dwarf galaxies we studied are like pitless peaches." The measurements suggest that some part of the theoretical model may have to be revised. "Our measurements contradict a basic prediction about the structure of cold dark matter in dwarf galaxies," said study leader Matt Walker of the Harvard-Smithsonian Center for Astrophysics in Cambridge, Mass. "Unless or until theorists can modify that prediction, cold dark matter is inconsistent with our observational data." Dwarf galaxies like Fornax and Sculptor are especially good places to study dark matter, because they are thought to be almost entirely made up of the stuff. Only one percent of matter in a dwarf galaxy is thought to be the normal matter that makes up stars. To determine where and how much dark matter inhabits the dwarf galaxies, the researchers studied the motions of 1,500 to 2,500 visible stars, which reflect the gravitational forces acting on them from dark matter. Some researchers have suggested that when dark matter interacts with normal matter it may tend to spread out, thus decreasing the density of dark matter in the centers of galaxies. However, so far, the cold dark matter model doesn't predict this. Either normal matter affects dark matter more than scientists thought, or it isn't cold and slow-moving, the researchers said. "After completing this study, we know less about dark matter than we did before," Walker said. The findings will be published in an upcoming issue of The Astrophysical Journal.